This is the mount that started it all! The MyPilotPro is universal to any aircraft and has been sold all around the world. 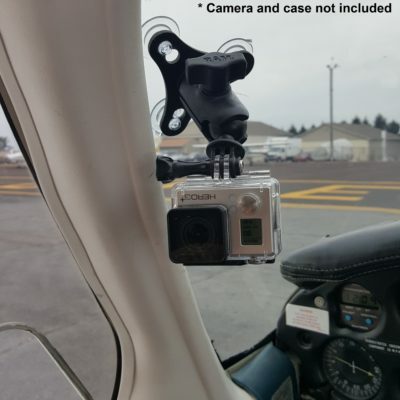 It's simplicity, safety features, and the complete lack of tools needed to attach it have made it very popular in the aviation community. It fits in the palm of your hand and can be attached in 30 seconds. It's made of aluminum and stainless steel and uses neoprene washers to isolate out engine induced vibration. The MyPilotPro Swivel is an upgrade from the original MyPilotPro and was a result of a customer asking if I could design a mount that rotates and articulates in any direction. The answer to that request was a resounding yes! It uses the same clamping mechanism, hardware, and safety features but we teamed up with the good folks at Ram Mounts to add a camera attachment that articulates in any angle or direction.